Pastoral Meanderings: What works and what does not. . . Some things just should not be done. A crocheted stole is one of those things. I do not fault the intent of the one who desired to use her talent for this purpose but to remind the church and her clergy that not everything is suitable for church usage. It is not a matter of snobbery but of suitability. Compare this with the previous post on beauty and you see not simply a difference in medium but in form, witness, craft, and, well, beauty. By the way, you can purchase equally unsuitable things from professional sources. The problem is not that it is, as they say, homemade, but that the medium is not suited to its purpose. 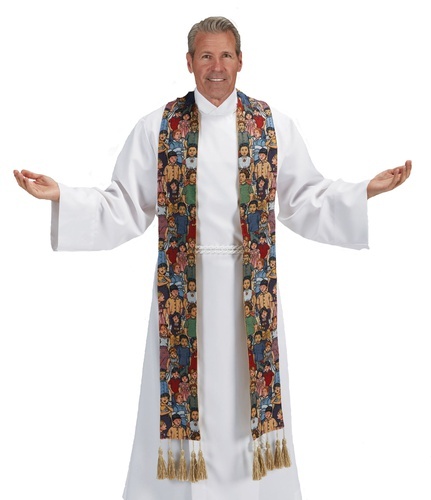 Laymen have an annual ugly sweater contest, but pastors have the ugly stole contest. Here's the "Where's Waldo?" stole.